According to a New York Times blog, The National Enquirer recently ran an apparently 100% fictional article suggesting that the late actor Philip Seymour Hoffman and playwright David Bar Katz were lovers who freebased cocaine together. Katz, a longtime friend of Hoffman's, successfully sued the publication for libel, resulting in a public apology and financial settlement that he used to create a group called the American Playwriting Foundation, which will give out an annual prize of $45,000 for an un-produced play. The prize will be called the Relentless Award, "[in] honor of Mr. Hoffman’s dogged pursuit of artistic truth." Image art found here. 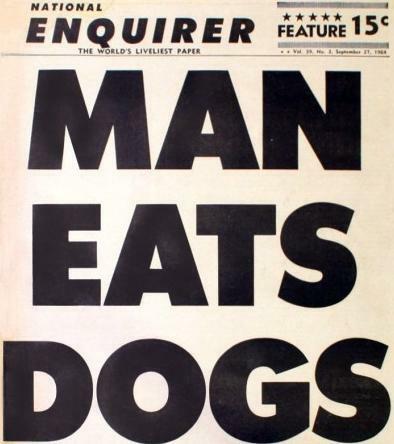 I have a strange affection for vintage tabloid covers; they weren't afraid to be eye-catching.